Weston/Westport Hebrew School recognizes what an exciting time this is in your child’s life. We hope that our Bar/Bat Mitzvah program will give your child the tools he/ she needs to properly navigate life as a responsible Jewish adult. We look forward to working with your child during this momentous time of their lives! In Jewish thought, 'celebrations of the spirit' also need to be ‘celebrations of the body’. So a Bar/Bat Mitzvah event needs to find tangible ways to express the spiritual milestone it celebrates. We believe that the most important event in the life of a young person, should be more than just rote memorization. 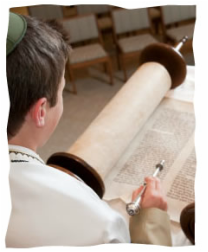 Our emphasis in preparing B’nai Mitzvah, is to appreciate the spiritual meaning of this milestone and to provide each child with the knowledge and tools necessary to be an active Jewish adult no matter what life brings. Private one on one Bar and Bat Mitzvah tutoring is available. Please inquire about scheduling and dates. We are committed to working with you to create a unique and special Bar/ Bat Mitzvah that will fit the needs of your child and be a most meaningful and memorable experience. We have partnered with Beth Israel of Westport/Norwalk 40 King Street, Norwalk (a 12 minute drive from Weston Center; on the border of Westport ) to utilize their magnificent sanctuary and social hall for your service and celebration, if you so wish.